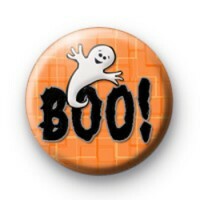 This Halloween Badge has a classic white ghost with the text BOO! Its just a simple design and ideal for Trick or Treaters or to pin on to your Halloween costume to make it even more fun. Our badges have metal pin badges & we have hundreds of Halloween badges so be sure to check them all out.